The Nuclear Advanced Manufacturing Research Centre (Nuclear AMRC) has worked with Rolls-Royce to significantly reduce the time it takes to manufacture a complex nuclear component. In nuclear power plants that use pressurised water reactors, special large heat exchangers pass heat from the primary system to the secondary system, producing steam from water in the process. The exchangers use baffles to hold tubes in place and direct the flow of liquid. 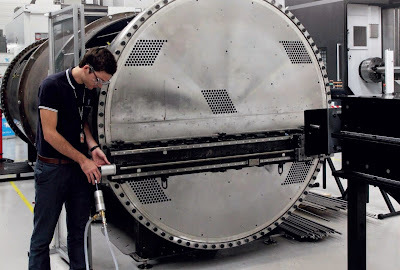 Hugo Lobato, technical programme manager in Rolls-Royce's new build and nuclear projects team, said: "Traditional approaches to building baffle cage assemblies, which make up about 20 per cent of a heat exchanger, rely on manual alignment of the baffle plates. We have replaced the manual approach with the introduction of laser tracking to build in a much higher degree of accuracy when inserting the tubes." The team used the Nuclear AMRC's Leica laser tracking system to create a real-time model of the whole assembly, allowing the position of each plate to be precisely mapped. The process was developed on a full-size assembly in the Nuclear AMRC's workshop. The centre's engineers procured or manufactured all parts of the test assembly, and provided engineering support to develop assembly instructions and risk assessments. The team also worked with specialist design engineers at the Nuclear AMRC's sister centre, the AMRC with Boeing, to create new assembly fixturing and devices to improve safety for the workers loading and positioning the plates. The techniques are widely used in the aerospace sector, but are not commonly found in the manufacture of heat exchangers. It could reduce assembly time by up to 80 per cent across a range of heat exchanger assemblies. In this example, it will help Rolls-Royce achieve its strategic target of reducing its domestic civil new build manufacturing and engineering costs by around half. Lobato added: "Using this method, we are confident we can consistently cut by half the time needed for the process. Furthermore, ensuring that tube placement is right first time further reduces delays and eliminates the potential for re-work and the cost associated with it. This yields predictable and consistent lead times, which is of great benefit to Rolls-Royce because it enhances the level of service we are able to deliver to our customer. "As a result of this work, which has had the highest focus on quality, we are able to confidently deliver to our customer a product that is right first time and within a much shorter lead-time. This outcome has only been achievable through innovative thinking and the application of state-of-the-art measuring tools and techniques." Outline plans have been approved for a 21,000 sq m "Project PoWeR" facility on the AMP for manufacturing and assembling power vessels for the next generation of nuclear power stations being built at home and potentially overseas. It will bring another 180 of the initial 360 jobs from Rolls-Royce and work will start when the world-renowned engineers receive the first orders for its nuclear components. slow it down. slow it down.